It’s autumn in New England, but that doesn’t mean that there isn’t plenty of racing left – weather permitting of course. This coming weekend, there are two major events planned for motorsports fans, one in Southern New England and one in Northern New England. The forecast is iffy at best, but that could be a moot point thanks to the fact that it’s rained close to non stop for the last week in various parts of the region and flooding of infields and pit areas could be a major issue. But if it dries out and the skies cooperate, the World Series at Thompson International Speedway (CT) and the Longjohn 150 at Unity Raceway both await fans and competitors. As of Thursday evening, both events are still a go for the weekend. The Tour Modifieds will make their fourth appearance of the season at Thompson with Ted Christopher and Tony Hirschman battling for the championship with two races left to go. Both drivers have won their share of races at Thompson, so it promises to be a close battle between the two. Speed51.com plans to be right there along with the hundreds of racecars this weekend to bring you the full story of the event next week. The World Series isn’t the only game in town this weekend though. The Longjohn 150 will close out the season at Unity Raceway in Maine on Saturday. The Boston Red Sox and New York Yankees won’t be going to a World Series this year, but race teams from several states will be as they decend upon Thompson this weekend for a jam packed weekend with 14 divisions of racing taking the green flag. Three open wheeled touring series will highlight the bill. The NASCAR Whelen Modified Tour, NEMA Midget Series and ISMA Supermodifieds will also run at Thompson, as well as the track’s regular divisions and a number of outlaw classes that will draw entries from tracks all over the area. Since almost all of those tracks will be idle this week, over 600 racecars are expected to jam the Thompson pit area. Tech officials will work around the different rules of each track by adjusting car weights as appropriate and the track claims that no safe racecar will be turned away this weekend. There will be everything from Mini Stocks to Modifieds. There will be several different divisions running at Unity, but the Pro Stock race will be the flagship event. The 150-lapper pays $3,200 to win and will likely include drivers such as Johnny Clark, Travis Benjamin, Scott Chubbuck, Randy Turner and Jeff Burgess. The Late Model/Super Sportsman and Super Stocks will each run 100 lappers paying $1,000 to win. Other classes running on Saturday include Modifieds, Late Model Pro Fours, Mini-Stocks, Mini-Trucks, Peanut and Wildcat divisions and Super Mini-Cups. Adult grandstand admission is only $15 and racing is set to start at 1pm. 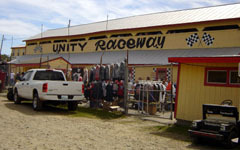 Unity Raceway will close out the Maine racing season this weekend.